Although women were marching in New York, demanding the right to vote, and Ford Motor Company had just manufactured its 1 millionth Model T, things in Wadsworth, Illinois in 1915 remained pretty ordinary. You rose before dawn, worked or went to school, and went to bed shortly after sunset. Not much time was spent socializing and news from the outside world was limited as radios did not become readily available until the 1920’s and then not many people could afford them. It was at this time that Loretta Dorothy Dietmeyer was born. Her arrival came in the fall at her parent’s home in a small country village about 50 miles north of Chicago, Illinois. World War 1 was going on at the time and life was hard. Loretta’s dad was a poor farmer trying to support his family of 5, as best as he could. Her mom spent her days caring for Loretta and her 2 siblings, cooking, preparing food for storage and making clothes by hand. There was no electricity or indoor plumbing and travel was by horse and buggy. In the coming years two more boys would be born to the family and life would get harder during the Great Depression of 1929. As Loretta grew she attended a small one room school house quite a few miles from her home. She and her siblings had to walk several miles to and from school each day in all kinds of weather. There were no such things as school busses, cars or bikes and often the harsh winters prohibited anyone from traveling anywhere. Loretta loved school and she did well in her studies, but after finishing 8th grade she had to quit because the family couldn’t afford to send her on to high school. She then went to live with her Aunt and Uncle on their nearby farm and did work for them for her room and board. Children often had to do that during the Depression time to help relieve the financial burdens of the parents who had big families. Loretta’s sister had already left a few years earlier to stay with another Aunt since she hadn’t done as well in school. It was at this time that the family moved from the village to a home in the country. As the years went by Loretta’s dad had to go on public aid to support the family and even though in 1930 President Hoover said “Prosperity is just around the corner” life for Loretta and her family continued to be difficult for many years, especially with the start of World War II in 1939. When I met Loretta for the first time in 1944 she was 29 years old. 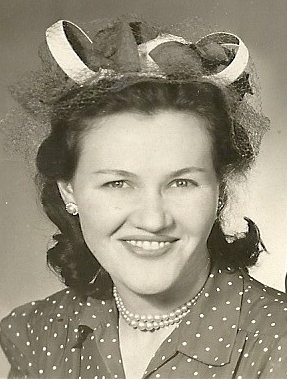 She was the beautiful wife of Erling who had been drafted by the Army because World War II was still going on and she was the mother of a curly headed little girl named Frances, who was 5 years old . Loretta had such a wonderful smile I couldn’t help but like her and as the nurse put me into her arms and said “Here is your baby girl”, I was so glad God had picked someone as special as she to be my mother for I felt safe and loved. Every time I had a birthday I celebrated another year of life, and my mother celebrated another year of motherhood. That, to her was Mother’s Day. The celebrations went on for 56 years and then she left me to go to her heavenly home. Each year on my birthday as I thank God for another year, I also give thanks for my mother and for the love and care she gave to me. I also take time to thank God for creating her and choosing her to be my mother, for she was truly one of His wonderful works !